2018 Triumph Speed Triple RS. Picture credits - Triumph. Submit more pictures. Take a look at the most powerful and responsive Speed Triples ever � the all new Speed Triple S and range-topping RS. With a major engine development, lighter weight and cutting edge technological advancements the iconic 1050cc Triple engine revs harder for longer, improving on its already legendary agility, razor-sharp handling, and pinpoint precision. Exhaust system: Stainless Steel 3 into 1 into 2. twin high level stainless steel pipes. Front brakes: Double disc. Brembo 4-piston Monobloc radial calipers. Switchable ABS. Rear brakes: Single disc. Single 2-piston sliding caliper. Switchable ABS. Ask questions Join the 18 Triumph Speed Triple RS discussion group or the general Triumph discussion group. Bikez.biz has an efficient motorcycle classifieds. Ads are free. Click here to sell a used 2018 Triumph Speed Triple RS or advertise any other MC for sale. 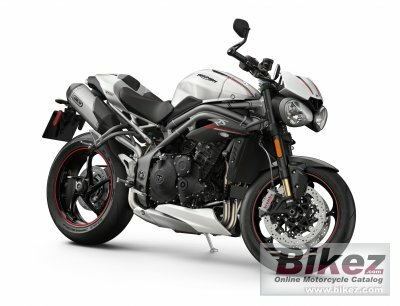 You can list all 2018 Triumph Speed Triple RS available and also sign up for e-mail notification when such bikes are advertised in the future. Bikez has a high number of users looking for used bikes. Before you buy this bike, you should view the list of related motorbikes Compare technical specs. Look at photos. And check out the rating of the bike's engine performance, repair costs, etc.